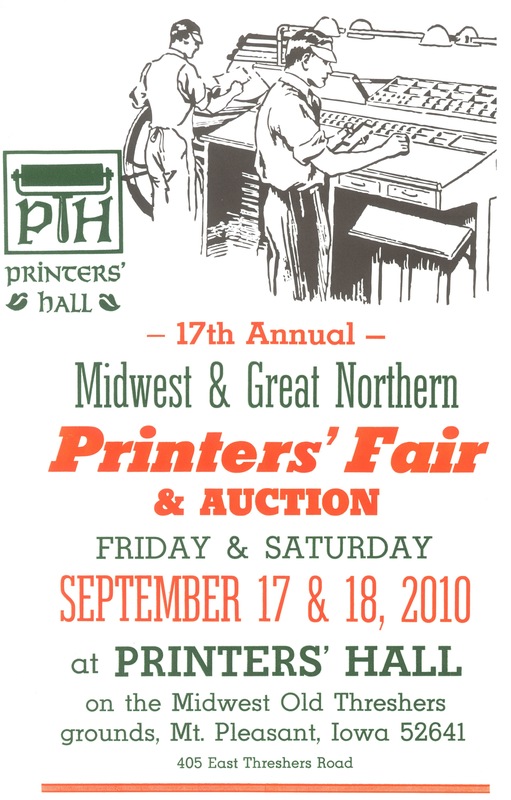 Come to the 17th Annual Printer’s Fair in beautiful Mt Pleasant Iowa! Come to play with the Printer’s Hall collection of type, presses including Vandercooks, Heidleberg Windmill, Babcock newspaper press(steam powered! ), and this year’s debut machine The Hickock Ruling machine, a marvel of technology! See the Linotypes in action, pull a print from an iron hand press or presses powered by antique gasoline engines. If you’re looking for supplies or to build up your collection of type, stick around for the Swap Meet and the closing Auction. Have stuff you’d like to sell? Get a table to peddle your surplus. Event begins on Thursday with workshops, demonstrations and camaraderie. 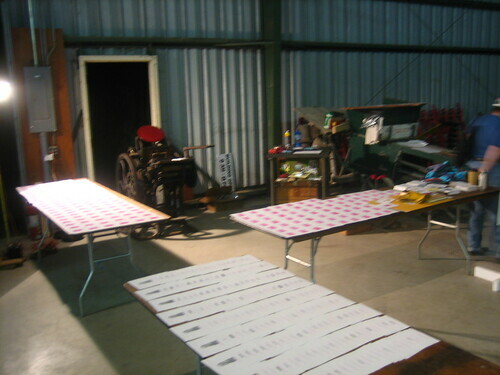 There will be instruction on various pieces of equipment, playing with type and lots of shop talk! Friday sees vendor set-up and more work/project time. Saturday is the Sale/Swap Meet from 8 am sharp til 12 noon. Auction begins at 1 pm. Come ready to bid and get a great deal! So I went to look at some studio spaces in Bridgeport neighborhood last night with a friend who is interested in teaming up to split costs. The area is great, old industry, converted to modern small-scale manufacturing. The building I was looking at is part of the Chicago Sustainable Manufacturing Center, otherwise known as Bubbly Dynamics owned by John Edel. I’ve been acquainted with him for some time, and remember when the building was just taking its baby steps toward renovation. It was a mess, really, full of timber, old windows, junk and other people’s storage (John’s a nice guy like that). I haven’t been there in almost 2 years, and when I rolled up on my bicycle, I didn’t recognize the place! The road had been paved, the factory across the street was razed. There was a sidewalk and curb cuts, and TREES. Wow. What a difference. Chicago really did some work over there. That makes me glad. Then, inside the building was another impressive sight. John had transformed this building into a gorgeous glowing example of economy and sustainability, married with fantastic design and beauty. The walls that I’d been previously impressed with the fact that they had been sheet rocked finally, were now real solid walls, painted, trimmed with art on them. Oh! The big lobby sign was great too! The windows and doors and all the little things: finished and sealed concrete floors, HEAT!, some nice ficus in the hallways, lovely hand made railings on the stairs. So lovely. As we toured the building, John pointed out how all the materials were salvaged, or donated. This door was pulled out of a junk yard, this railing was old brewery pipe, this glass block wall was reconstructed from block that was taken out of somewhere else in the building, this expensive Italian tile in the restroom was left behind by a contractor. Yay! For freebies. We saw two different available spaces in the Center. One on the second floor, with nice windows. Not much of a view, but what can you really ask for in the manufacturing district? (Also, it smelled like cinnamon the whole time we were there. The Factory down the road, makes every kind of off-brand “Pop-Tart” sold in the US.) This space was just about 600 square feet. More than adequate for my needs, but I was going to team up with Chuck, so we went to the basement to see the larger space, but not before we went up to the roof. A few years ago, I had gone to Bubbly and helped plant the roof top garden. John’s daughter’s face had been pixelized and mapped out with plant colors, and we were planting a picture of her. It didn’t look like much then, but now, wow! I can’t wait to Google Maps updates their satellite photos! Its very clearly a child’s face on the roof, in plants! Now I’m rolling around the numbers in my head, thinking about what I’d have to do to get into that space. Sheesh. I’d have to get the capital funds to start up the business. Then, I’d have to move all my equipment in, which would be ok because there’s a freight elevator and loading dock. Then, I’d have to get all my stuff up from Saint Louis that’s still sitting over there. ugh. Then there’s planning to bring in enough money to pay rent in 2 spaces one to live one to work. Thankfully, the utilities are included at Bubbly. The other tenants we met seemed excited to have printing in the building. 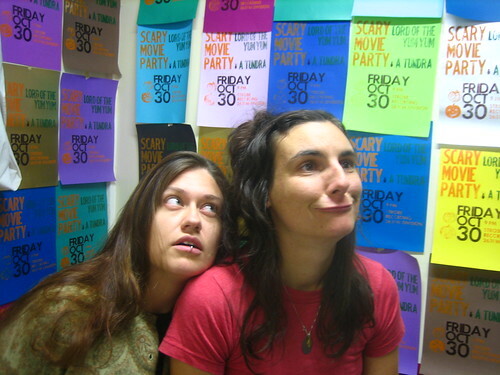 Two are screen printing artists, and a few are people I know from the O.G. Chicago bicycle scene. It seems like an ideal space to work from, collaborate within and maybe become a real participating part of something meaningful and sustainable. The only problem now, is the funding. 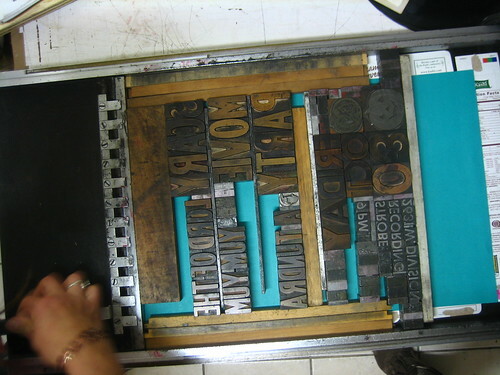 And the fact that if I have the space, I now NEED a Vandercook. Dang. 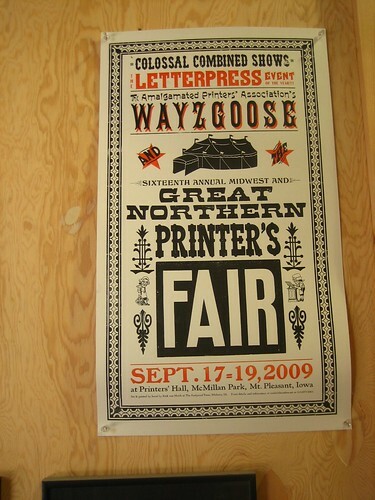 Last weekend was the Amalgmated Printer’s Association Wayzgoose, also called the Playgoose, and the Iowayzgoose because it took place in Mt. Pleasant Iowa. Mt. Pleasant is a middle-of-nowhere kind of town. Unmarked roads, faded vinyl siding, its not too much to see really. But they have the Midwest Old Threshers, a big fairgrounds with several buildings on it, all housing turn-of-the-century equipment for industry and farming, even a few exhibits on homestead technology from when the Pioneers settled and farmed Iowa and the surrounding region. And even a Printer’s Hall with a steam powered printing press! This year, the Annual Great Northern and Midwest Printer’s Fair ALSO coincided with the Annual APA Wayzgoose, making this event a double-your-fun, double-your-excitement weekend. I camped out over the weekend, out by the trolley tracks (yes, they have a working trolley too!) and a lot of time exploring all the museums had to offer. Steve Alt, one of the volunteers there and an all around awesome guy (who not only prints on a 100 year old press powered by an antique gasoline engine, but also restores antique cars and engines), gave me a few great tours of the place. He took me into the boiler room and its his voice you hear in the first video explaining the mechanics of the generator. He also got me into the cab of the No. 9 and on the caboose for a ride around the track! 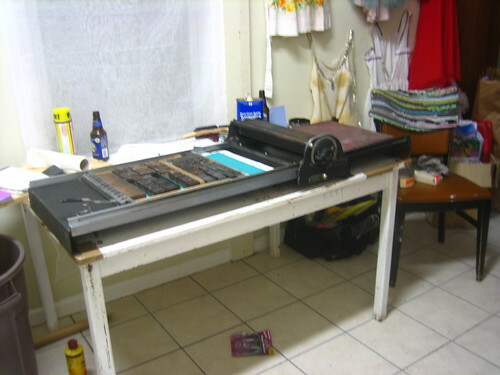 He let me print a few pieces on his Gordon Press for the APA print exchange bundle, which was so much fun! I used it powered by the engine, and also foot-treadled it manually. Its a fantastic little press! The Swap Meet was great! There were a lot more vendors than last year, and a lot more people from the outside I think. I sold a good amount of things from Mr. Meers, and then put a lot of the rest into the auction. We made some good coin at the auction! I was very pleased. I ended up selling 75% of what I had lugged up there. Awesome! I got to put a lot of faces to names, which was good too. Many people I’d “met” on printing forums or mailing lists, and never spoken to face to face. Now, I’m proud to actually be able to call them acquaintances. 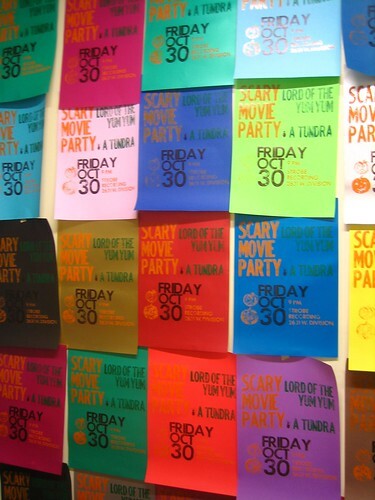 I got to rub elbows with of the fellows from the Hamilton Wood Type Museum, Jim Moran. We talked about workshops and events up in Two Rivers, Wisconsin. I hope I can make it out there in December for a presentation by Jim Sherraden of Hatch Show Print. It was a really great weekend, and I can’t wait for next years Wayzgoose in Huntington, W. Virginia! No more! I’ve found this handy little number among the heaps of junk in the Meers collection. How cool!!!! 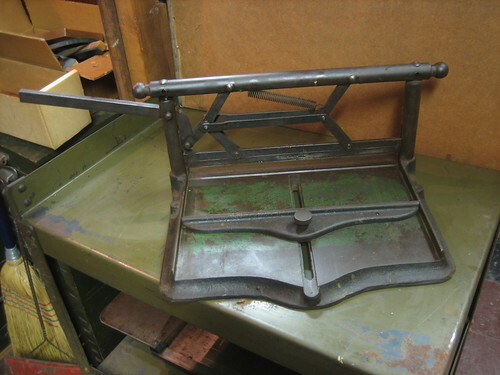 An antique scoring machine. I love it already. 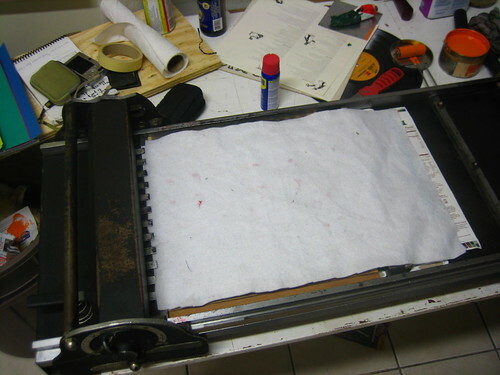 It will score at least two sheets of card stock at once, nice and smooth. Its lever action would make short work of maybe four or more sheets. I’ll have to try it today. When I pulled it out, it was covered in rust and really dirty. I wiped it down and took some 200 grit sand paper to it. It was tedious, because of all the ins and out and little grooves to sand out. Then, I wiped the whole thing down with a thin coat of machine oil, and oiled all the joints. I wish I had a “before” picture, but I was too excited to bother with pictures at the time. The back of it has a lovely little paper guide that I thought was frozen one with rust but a little sanding and oil and it slides nice and smooth now. I don’t know why its green. I don’t think it was painted, I have a feeling someone used it as an ink mixing surface. :/ Hacks. Its just so simple and beautiful and practical! It makes me actually WANT to score hundreds of note cards and envelopes! yay! I came across this fine fellow, Martin Howard, owner of AntiqueTypewriters.com. We had a nice email exchange about collecting, about printing, about what we might want to buy/sell/trade with each other, and I was even able to inform him about a few pieces he had in his collection that he wasn’t sure of their purpose (yay! now everybody got their shout-out). If you’re interested in nostalgia, office equipment, the industrial revolution, steampunk or fancy hunks of metal, do visit his site. Its impressive and very enjoyable! Be sure to check out the detail photos when they’re there. Some of these typewriters have the most delicate little flowers and filigrees painted on them! What ever happened to that kind of craftsmanship? The what now? The Wayzgoose! 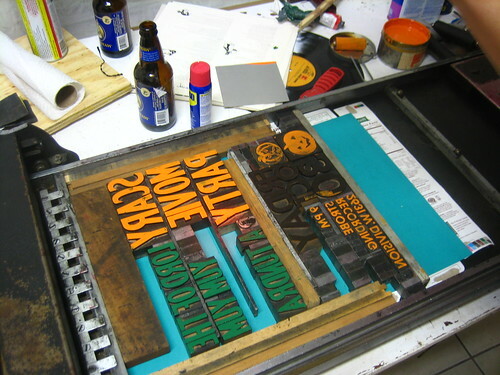 Only the most important letterpress printing event of the year, duh. If you are a letterpress printer, printmaker, graphic Designer, historian, tech geek, type geek, letterpress printer n00b or just curious about steam power, you NEED to be at the Old Thrasher’s Museum in Mt. Pleasant, Iowa September 17 – 19, 2009. 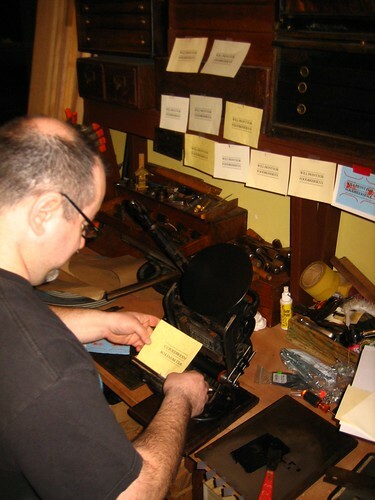 The Amalgamated Printer’s Association will hold its annual Wayzgoose event where you’ll meet other members, participate in demonstrations, work on your own prints, play with machines like a Heidelberg Windmill, an iron hand press (Like Gutenberg used! 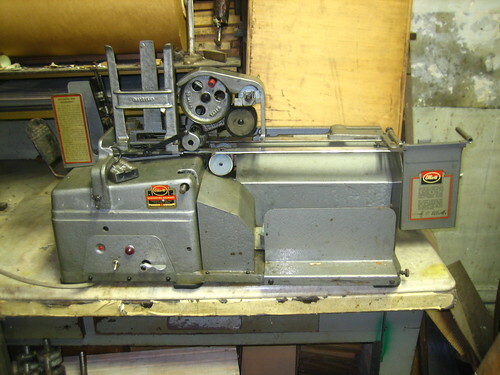 ), a steam powered Babcock press, Linotypes, Ludlows, and bears OH MY! Then, Saturday is a big old Swap Meet and Auction! 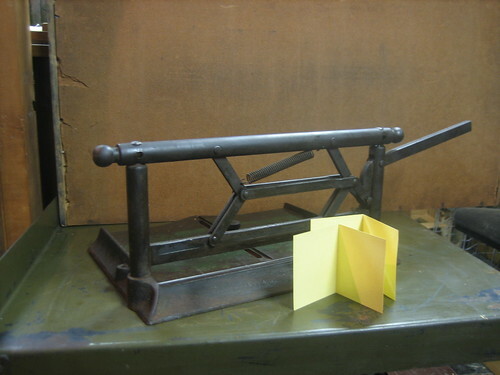 Come get a new hand press to play with, buy type, supplies and all manner if nifty things you didn’t know your letterpress shop needed but you MUST have. I’ll be there selling as well! I’ve got lots of treasures, but I’m not telling you about them, its a surprise. So get your lazy can off the computer and start planning your September events calendar!